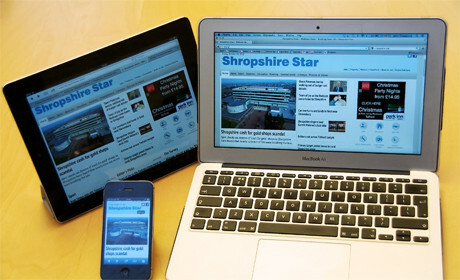 In August the Shropshire Star launched a responsive site, with sister title the Express & Star following suit the following month. Midland News Association's (MNA) regional sites were ahead of some nationals and global news sites in moving to responsive design, which scales to fit the size of the screen the site is viewed on. Channel 4 News launched its responsive site in August, the Guardian unveiled its 'work-in-progress' site earlier this month, and BBC News is currently rolling out its new offering. The shift to responsive came out of MNA's "mobile-first strategy", which launched a year ago, with the team responding to a significant rise in the number of people reading their sites on mobile and tablet devices, William Beavis, head of digital at MNA told Journalism.co.uk. During the first quarter of last year, 11 to 12 per cent of people accessing MNA's sites were doing so from mobile devices. This rose to 30 per cent in the first quarter of this year, Beavis said. He explained that last year MNA was "making entries into the app market" and considering the best path. "We found that to keep pace with technologies and new operating systems, apps would potentially prove to be a very expensive route to follow because you have to build multiple apps for multiple devices." He explained that each type of device would require a different native app, each would later require feature and design updates, and the process would prove costly. "We looked at how we might be better able to deliver a product and a service that gave a consistent experience to a user no matter what device they were on," he said. At that point MNA and its team started to look at responsive design or adaptive design. Beavis explained that it was at that point in November last year that MNA adopted a "mobile-first strategy". "The mobile-first strategy means that when we looked at the way we were going to present our content, when we looked at our wireframes and our designs, we started with a mobile device in mind first and then worked our way back up to the desktop". The development of the site was all done in-house, with the team taking some inspiration from the BostonGlobe.com, a responsive site. Asked how the audiences of the Shropshire Star and the Express and Star have reacted to the move to responsive design, Beavis said the sites have been "really well received". "We've had an awful lot of positive feedback from users. As you might expect from users on mobile devices [they] absolutely love it." Advertisers also see the benefits, Beavis explained. "One of the issues that we faced was that if you were on our site previously and you accessed it on an iPhone, it was quite difficult to read the content of a leaderboard or a banner ad. "What happens now is our site is intelligent enough to recognise that you are on our website and looking at us on an iPhone so it can serve up a mobile advertisement instead of what I would call a standard desktop-size ad. "That means the advertiser gets a better response because the ads are generally clearer and the site is built to accommodate those ads better and so the user can interact with them better as well." Shifting to responsive design "does save you money", Beavis said, as "it means that you don't have to develop so many apps for so many different platforms". He explained that MNA offers page-turning apps of the print titles (using PageSuite technology) and they may consider further apps, for example in niche areas, in the future. "But in terms of our main news sites, this is the perfect solution for us," he added. With mobile viewing growing from 11 to 12 per cent in the first quarter of 2011 to 30 per cent in the first quarter this year, does Beavis expect that trend to continue? "Mobile traffic is now hovering just below 35 per cent", he explained, and he predicts an increase in people accessing the sites from a tablet. "It's very difficult to predict, but with Christmas coming up, the new [Microsoft tablet] Surface announced, and with the Amazon Fire HD being pushed, come quarter one next year there's going to be a whole bunch more users out there, particularly with tablets, which are becoming much more affordable."